Congratulations to all our Years 7 to 10 students who had a fantastic time learning to sail the school's 420 dinghies last week. Members of the Wentworth Sailing Academy skippered the boats, directing the willing learners what to pull and where to sit etc. Many of the teachers also took part and thoroughly enjoyed learning to sailing with the students, sharing the laughs as well as the spills. Well done to all involved. 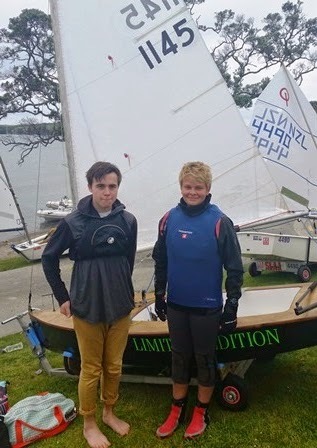 Well done to Oliver Reeves who represented Wentworth at a school fleet regatta at Algies Bay on Monday. Oliver wasn't placed in the 4 races but it was a great learning experience. Big thank you to Cameron Hughes who came along as support. Wentworth students selected for top teams! Congratulations to Skye Collins-Maginley (Year 9) who has been selected for the U15 Girls' Elite team to represent North Harbour at this season's Touch Tournament. Skye will also be trialling for New Zealand in February. Congratulations also to Rosalie Reeves (Year 12) who has been named in the U17 Poi Tarawhiti o Te Raki Paewhenua Netball team to represent the Maori province north of the bridge in a national tournament next Easter. Our junior girls' rowing squad (made up of Rebecca Faletanoai, Mia Cunningham-South, Alicia McColl, Shena Donald and cox Alana Pribicevich) had their first win at the recent WTMC-TAKA Regatta at Lake Pupuke in the Girls' U15 Coxed Quad Sculls. The girls had a brilliant start and led the race the entire way. It was an amazing race to watch as the distance between them and the second boat just got bigger and bigger, with Wentworth rowers winning by at least 6 boat lengths! The best part of the race was listening to the commentator who said, "This Wentworth crew look very polished for this stage in the season. A big compliment must go to whomever is coaching them." We look forward to more of this from this crew.